Day 1: Arrival to Marrakech airport, our guide will meet you and take you to the hotel which is inside of the Midina, free evening to visit the place of Jamaa El Fna. Day 2: Departure from Marrakech. Ouarzazate via the Tizi N'Tichka pass, at 2260m. Stop to visit the former Palace of Pasha El Gualoui, in Telouet. Then on along the Ait Ben Haddou valley. This is film-making country, the backdrop to such films as Laurence of Arabia, Romancing The Stone and Mary of Nazareth. We camp near the Ksar. Day 3: Today we leave Ait Ben Haddou, passing through Amerzgane and Taznaght on the way to Foum Zguid, where we spend the night under canvas. A beautiful road through oasis and villages. Day 4: We leave Foum Zguid and head to the night's camping place at Chegaga. Chegaga leads us into the desert-arid plains, black peaks, valleys of sand and tamarinds. There are three days of desert life and experiences before you, at this point. Day 5: Striking camp at Chegaga, we go on towards Mhamid and Zagora. We spend the night under the desert stars among the small dunes near Tizi N'Tafilalet. 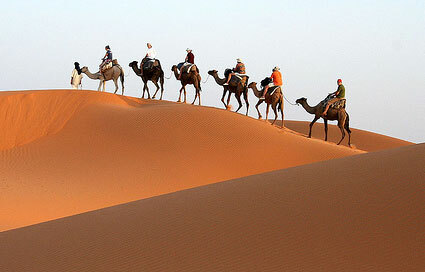 Day 6: On towards the El Maider dunes, a prefect place to observe the symphony of color, the sunset in the desert. Another night in the peace and silence of the desert. 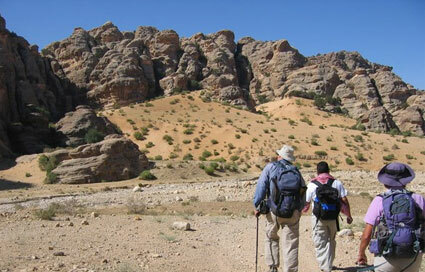 Day 7: We will enjoy a relaxed and colorful day as we visit the Tafilalet Valley, Cradle of the Alouite Dynasty. 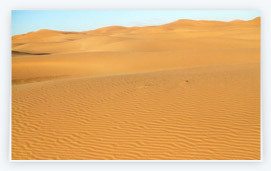 We set up camp near Merzuga and climb some of the Erg Chebbi dunes. Day 8: Off to Erfoud through Tinerhir with a visit to the fossil beds, and a night under canvas in the Todra gorge between beetling cliffs. 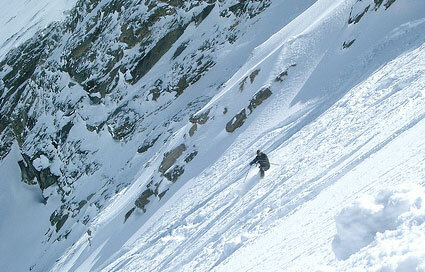 Day 9: Today we go deeper into the Todra Gorge towards Tamtatouchte, know as the farthest village from "civilization". Here, man lives in harmony with a harsh, unforgiving and yet an infinitely beautiful, natural world. Another camp is set up for us in the Dades Gorge near Msemrir. Day 10: Through the Dades Gorge to Boumalne, Kliat Mgouna and to Boutaghrar for overnight accommodation in the tents. Day 11: We travel from Boutaghrar across the Iguernane plateau to set up camp in Skoura. Day 12: In the morning we head towards Ourzazate where we visit the town and its Kasbahs. We camp near Taliouine. Day 13: Up to the Tizi N'Test pass, we pass through wonderful villages and spectacular landscapes. This is a chance to see "The Argan", a type of tree that exists only in Western Morocco and Mexico. The last night of the trek is spent in the village of Imlil. Day 14: Return to Marrakech in the morning. Day 15: A guided tour of Marrakech will be arranged for the morning, with the rest of the day free to explore the sights and sounds.